In the current turbulent economic climate, some people just want a little extra security. There’s nothing safer or more likely to maintain its value than gold. Unless, say, a giant meteor of gold strikes the Earth somewhere and completely throws off the world’s economy, betting on gold is a fairly safe bet. That’s why the German company Ex Oriente Lux, headed by Thomas Geissler, has introduced Gold To Go, the world’s first gold vending machine. There was a test machine in Germany, but the first official Gold To Go location is in Abu Dhabi’s Emirates Palace Hotel, where billionaires go to play and where gold is incredibly popular. The machine itself, also plated in gold, has become an attraction in and of itself, as customers come around from all the nearby restaurants when someone bellies up to the machine for a quick nugget or two. Currently, it only takes local currency, but plans are to expand its ability to take credit cards. Right now, the machine dispenses 1, 5, and 10-ounce gold bars, gold coins, and a few other gold trinkets. 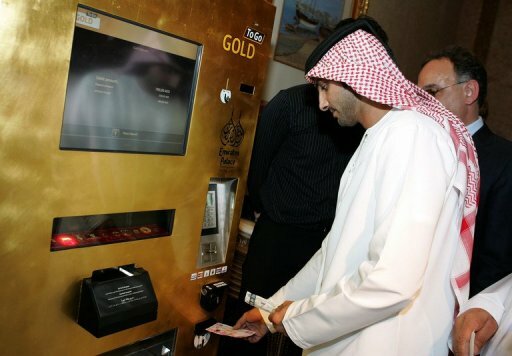 Ex Oriente Lux also plans to fill the machine with gold coins stamped with the Emirates Palace logo, for tourists who want to say they got gold from the machine. The system keeps track of current gold prices online, updating every 10 minutes. So, if you see the price of gold is spiking, get yourself to Emirates Palace and get in before the prices rise!